First I dyed some of the fleece. I used a crockpot and did three different pots of dyes, using regular red and yellow grocery store food coloring, vinegar, and water. One pot was for red, the second was yellow, and the third a mixture of the two colors for orange. 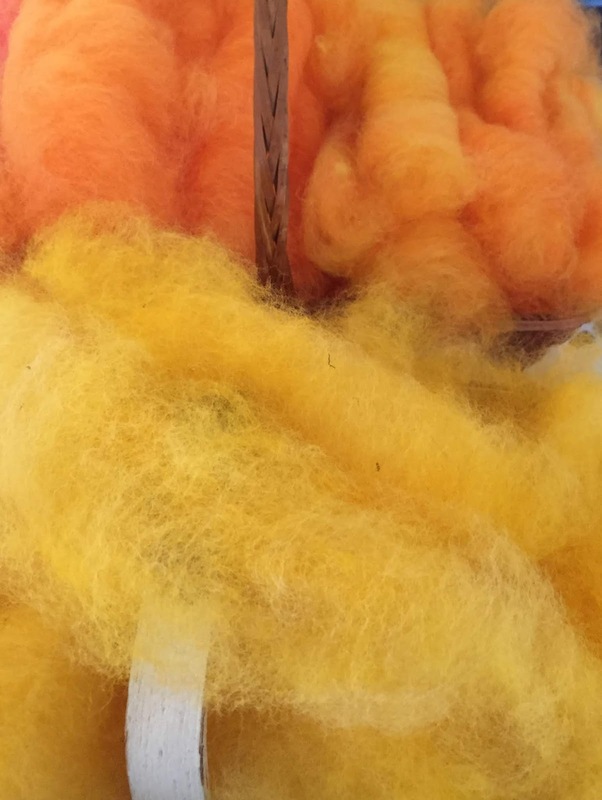 Here are the yellow and orange batches after being carded and piled into baskets. 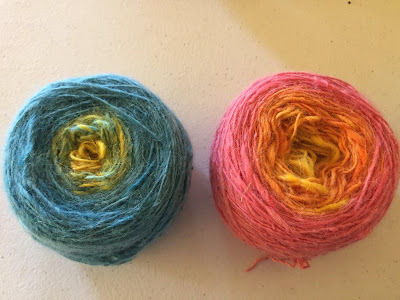 I also discovered a bag of blue wool from the same fleece that I had previously acid dyed. Starting with the red dye batch (which turned out pink), I carded some of that, then blended and carded some of it with orange, then carded pure orange, then blended and carded some orange with yellow, then carded pure yellow, then blended and carded yellow with the blue, and then carded up the rest of the blue. That sounds confusing even to me. I ended up with these six yarn colors: Pink, pink/orange, orange, orange/yellow, yellow, yellow/blue, and blue. Here is everything all spun up and ready for knitting. Using my current favorite pattern called Easy Peazy Shawlette, I used most of the yarn to knit this small shawl, which will be the perfect size when we finally get some cooler weather. In this photo it has been washed and pinned while damp to the bed for blocking. Just out of the frame, an invisible Henry the cat is waiting to snuggle up on the damp shawl for a nap. Here is a close up shot so that you can see some of the color variations. Henry liked the pink part best and spent a couple of hours sleeping on it and helping it to dry.